On Wednesday morning, I'll be on a plane heading to Miami. I haven't been to Miami in more than a decade. I haven't been on a plane solo since I became a mom. I'm only going for three days, but it will the longest I've been away from The Husband and The Boy. I'm sort of freaking out. And like any other mom leaving her family, I am feeling the smallest twinge of guilt. I'm not going to Miami to lounge on the beach or hang at Wet Willie's. I'm going to Hispanicize. My very first blog/media conference. Back in January when Chantilly asked if I would be interested in speaking on a panel she was moderating, I immediately accepted. The panel is Blogging for a Cause and I'll be with 2 other amazing blog writers - Laura & Eliana. I have spent the last year reading their blogs and I am so excited to meet them. To be asked to speak at this conference is such an honor for me. To be able to talk about autism during Autism Awareness Month to a prodominantly Latino audience. 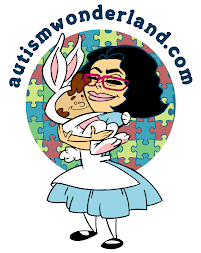 To meet other Latino blog writers also writing about autism. I still cannot believe it. When I started this blog a year and a half ago as a class assignment I had no idea people would even read it. I had no idea what kind of impact it would have. Or the opportunities that would come out of this. All I wanted was a place to share my thoughts and in return I've gotten so much more. I cannot wait to tell you all about it when I return! Chantilly Pantino is a blogger who wears many hats. You can learn more about her at www.BiculturalMom.com. Laura Tellado is a young woman with Spina Bifida. Her blog is called Holdin' Out for a Hero. But I believe she is a hero to many. Who else will be speaking at Hispanicize? Click HERE & find out.